We have had limited internet access but wanted to send out a quick update. How much we have been warmed by your prayers and notes of encouragement to us. I can’t tell you how in the midst of much that is unknown we are comforted by the love exhibited from those we know. Our home somehow was packed up, put into storage – some things shipped up here; cleaned up – and we left Sanda with a lot of tears but very full hearts. A large group of our community came on Wednesday morning to see us off – we will never forget that morning! I think it really helped our children as well to see their friends for the last time and to feel so loved! We have had two good nights’ sleep since arriving here, despite being woken up both nights by earthquakes or aftershocks. Apparently this is fairly normal occurrences we will get used to. 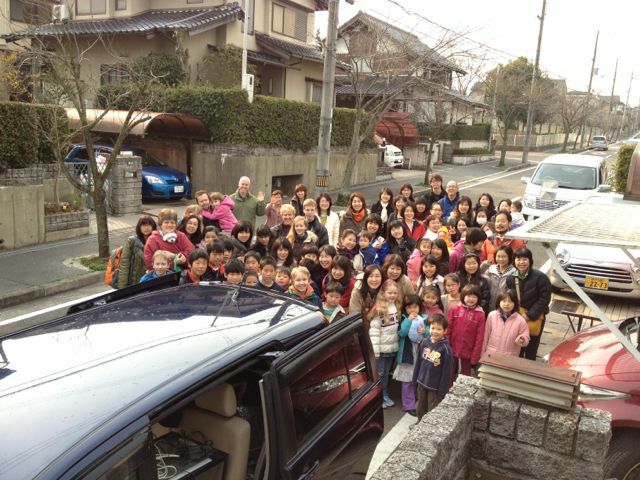 The kids have had a great time playing all day and night with the other Be One kids and some neighbor kids, as well as attending two Crash-Japan sponsored events to help children deal with trauma. We are staying in a guest house, until our temporary house is ready. We may be able to move in on Monday. Volunteers have been laying down the floors and getting rid of trash today. Still some plumbing problems it seems, but it’s come a long way! There are over thirty volunteers up here for spring break, so there is never a dull moment!